This moon card reminds me of the subconscious and our hidden depths. The lobster is starting to crawl out of the primal pool representing our emotions. The moon is facing away, seemingly unaware of what is occurring beneath her. The two dogs remind me of animal instincts. There is a large amount of stuff rising out of my emotional depths which seems to come and go in cycles – rather like the moon waxes and wanes. Sometimes it feels out of my control and I can only fall back on my instinctual, habitual behaviour – howling at the moon. It also relates to dreams and how these can provide valuable insight. I’ve been experiencing very vivid and deep dreams in the last few weeks which I’ve felt have been bringing things out of my subconscious. The 2 of Coins visually links with the Moon. The top coin takes the place of the Moon and the bottom one takes the place of the lobster. The two dogs are replaced by flowers. 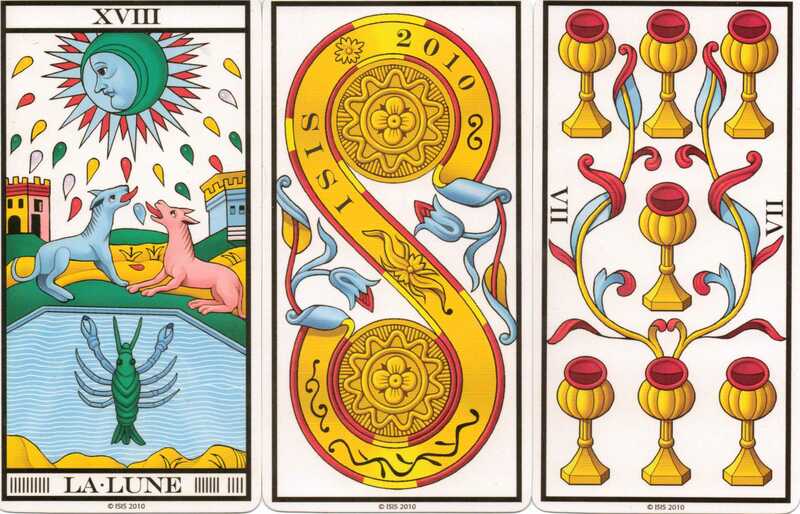 This card represents cooperation, bringing things together so that they work in harmony. The 7 of Cups suggests that I may receive flashes of inspiration – however these may pass quickly and I should note them when they occur. The way the leaves curl round one cup suggests that one idea in particular is worth pursuing. The 2 of Coins as the central card suggests that my dreams are beneficial at the moment. There is a cooperation between my conscious and unconscious to bring valuable insight to light. 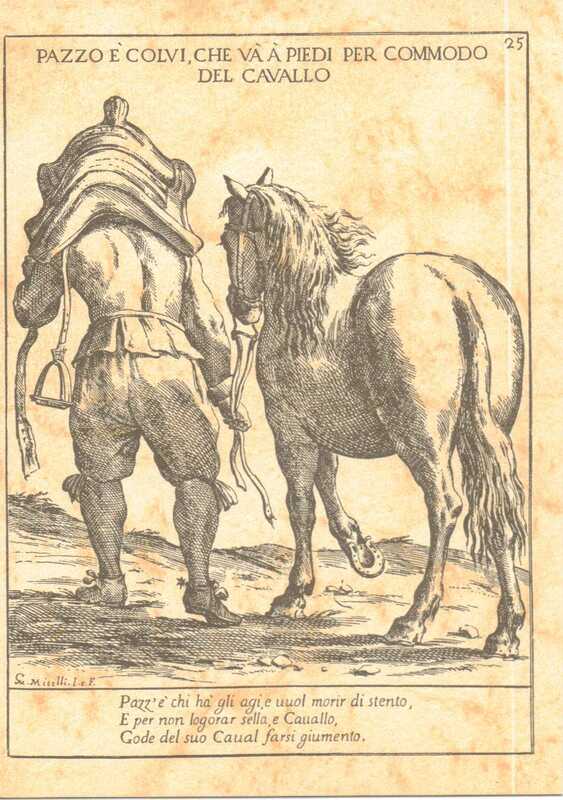 I Proverbi Figurati for today gives me: pazzo e colui, che va a piedi per commodo del cavallo. Or crazy is the man who walks for the sake of the comfort of his horse. This seems like a message concerning taking on burdens which are not your own. How many times do we take on something which inconveniences us but which eases the load for someone else! Often that person may well be better equipped than we are to do the job. British Summer Time began today signalling increasing hours of daylight in the evenings. Yesterday was a beautiful spring day – sun shining, birds singing, increasing number of plants blooming. This time of year always gives me a spring cleaning urge. How can I make the most of the increasing hours of daylight? How appropriate to draw the Sun card on this question. 🙂 Two figures bask in its rays near water. This card makes me think of the seaside especially with the wall behind – protection for the promenade. I haven’t visited the coast for ages and a few days out at some favourite places would be lovely. The 6 of Cups is a very balanced card – it speaks of harmony and growth. The colours match those of the Sun suggesting that the longer evenings will bring a feeling of peace and balance. The Ace of Batons is a return visitor. 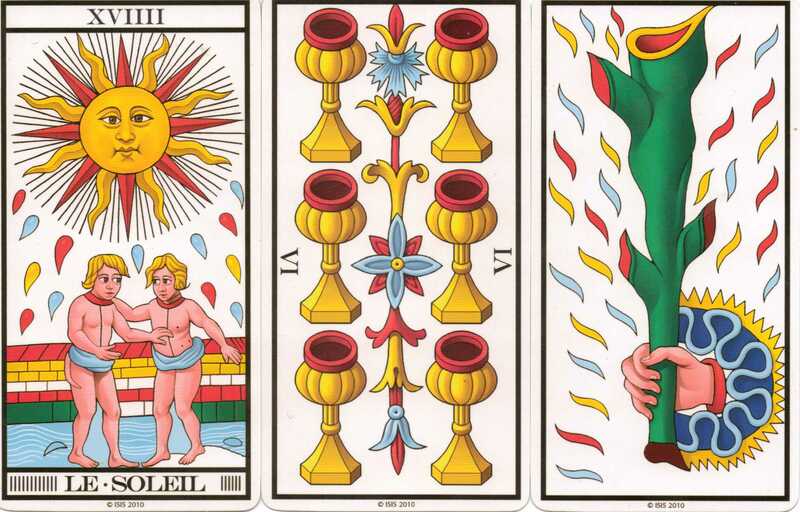 The baton has replaced the flowering stem in the 6 of Cups but is accompanied by the drops falling from the Sun. The green is only matched by the foundations of the wall. It heralds a time to build solid foundations, to take inspiration and use it with single-minded focus to make the changes I want to see in my life. Make hay while the sun shines. The Proverbi Figurati for today is Chi si crede esser piu savio de gli altri, quello e piu pazzo di tutti. Rough translation is: Someone who thinks they are more knowledgeable than others, is more foolish than all. I quite like this idea. It reminds me of people who are so completely sure that they are right – everyone else is wrong. However, if we cannot be humble enough to learn from others, we will never grow as a person. It is foolish to presume that we know everything. After a week’s break from blogging, I’m back with the ISIS Marseille and the ‘Proverbi Figurati di Giuseppe Maria Mitelli’. The first is a beautifully coloured, expressive TdM from Japan, the second is a deck which a few of the Deck of the Week group have tried (quick wave to Jema, AJ and Bodhiseed). 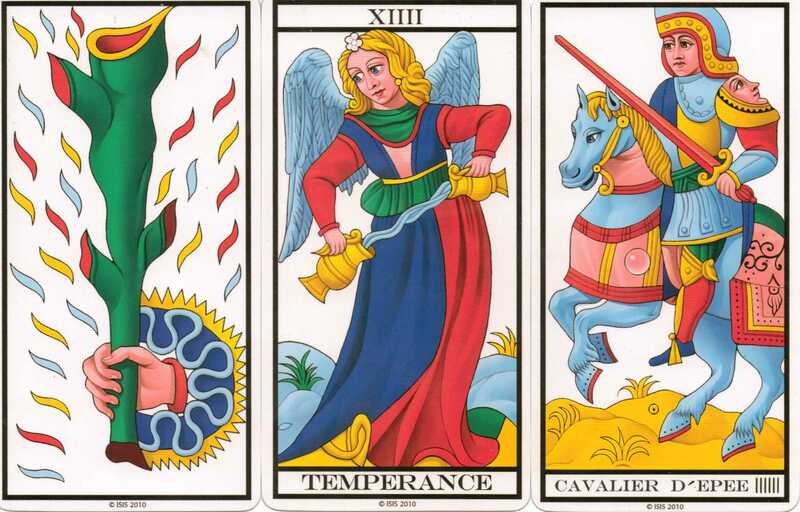 Temperance is the central card, advising caution and a moderate approach. Her eyes are fixed on the hand holding the baton. She is looking at it while mixing the water in the jugs, finding a way to temper the energy it represents before it does too much damage. The Ace represents an idea or impulse which can become slightly obsessive, although here my first thought was that it was a stick to beat someone with. Obsessive ideas can do that – we can become so focussed on them that we chastise others who fail to live up to our expectations. Coming in from the right, the knight charges forward resolutely fixed on cutting something down to size. The question is whether he wants to cut down the restraining influence of Temperance or the obsession of the Ace. My instincts tell me he wants to cut down Temperance who is oblivious to the threat behind her. A clear warning that my tendency towards moderation and compromise is not welcomed by all. There are others for whom an idea has become so important that they will not want to hear alternatives. Time to watch my back. 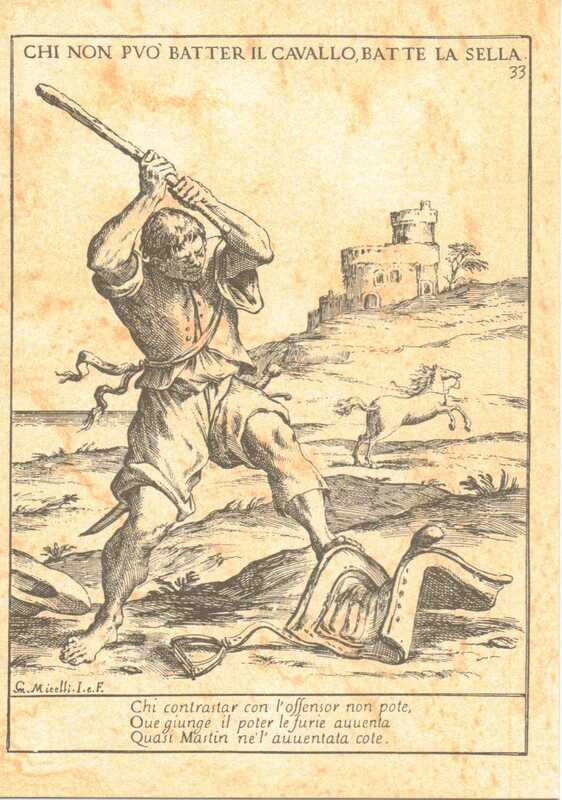 a loose translation of which is ‘Someone who cannot beat a horse, beats the saddle’. The implication here is which is more useful to have at your beck and call – a horse which you have tamed of its wilfulness or a saddle? It seems to imply that it is necessary to focus your attention on the most important detail. This card advises dealing with the proverbial elephant in the room rather than something which will not be helpful in the long run. 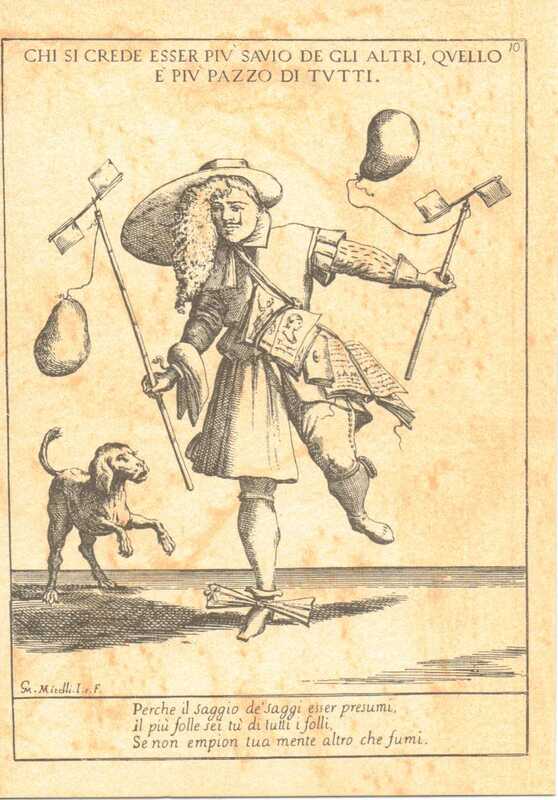 Interesting that both cards talk about something which needs to be dealt with – the first is the hidden threat represented by the Cavalier and the second is the obvious thing which everybody ignores. Good advice for me at the present moment.